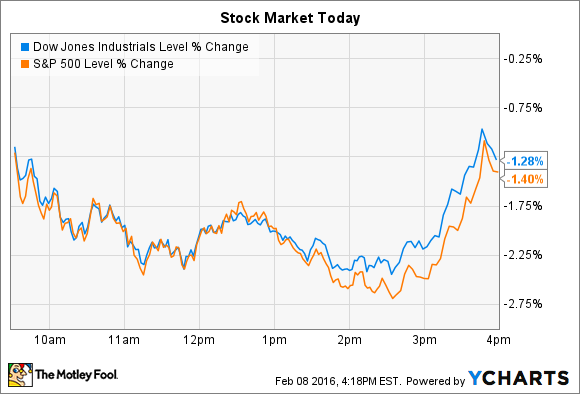 Indexes climbed back from session lows, but stocks still fell by more than 1% today. A late-session rally couldn't stop stocks from ending significantly lower today. The Dow Jones Industrial Average (DJINDICES:^DJI), which had been down by nearly 400 points, ended the day lower by 178 points, or 1.1%. The broader S&P 500 (SNPINDEX:^GSPC) lost 27 points, or 1.4%. Energy stocks were again subject to big declines as crude oil prices continued to fall. But the financial sector was the hardest hit today as investors sold off banks on worries over slowing global growth. Meanwhile, individual stocks making notables moves today included Internet review platform Yelp (NYSE:YELP) and toy retailer Hasbro (NASDAQ:HAS), which both posted fourth quarter results and updated outlooks on their 2016 business prospects. 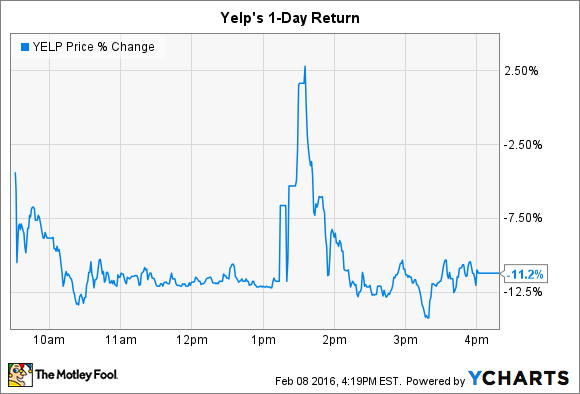 Yelp had a roller-coaster of a day that began with a 12% slump after the stock was hit with a Wall Street downgrade. Shares then spiked to a 3% gain in the minutes following the Internet company's fourth-quarter earnings release -- only to end the day down 11%. For the three months ended Dec. 31, Yelp posted 40% sales growth along with net loss of $22 million, or $0.29 per share. The revenue improvement was powered by significant growth in the mobile advertising business and was right in line with expectations, but the net loss shot past consensus estimates that had called for $0.09 per share of red ink. Yelp's profitability suffered as costs spiked higher by 57 %. The company also announced that its Chief Financial Officer, Rob Krolik, was stepping down from his position. On a positive note, the management team sees spiking usage of its app helping sales rise to $700 million in 2016, representing 26% growth over last year's result. While that forecast agreed with Wall Street's projections, investors chose instead to focus on Yelp's sinking profitability and uncertainty around its management team. Hasbro's stock rose 2% after the toys and games maker posted surprisingly strong fourth-quarter results. Sales for the critical holiday quarter rose 13%, or 23% after adjusting for exchange rate swings. Operating profit improved by 16% on a reported basis and by 29% without the transitional effects of foreign currency shifts. The retailer's profitability ticked up to 18% of sales from 17% in the year ago period. The standout performer was Hasbro's Boys division, which logged a 35% spike thanks to strong demand around Disney's (NYSE:DIS) Star Wars and Marvel movie hits. These merchandising wins helped the licensed brands segment jump to 28% of sales in Q4, well above the recent average near 20 %. Star Wars: The Force Awakens promises to continue to lift Hasbro's results this year as the movie makes its way into the home rental market. At the same time, Disney's Princess and Frozen doll products are just now being sold by Hasbro, instead of competitor Mattel. Deliveries to retailers "are now ramping up and early consumer indications are positive," CEO Brian Goldner said in a conference call. "Great partnership with Disney and our global retailers is resulting in a smooth transition...into this new business," he said .